When a long, long time ago our ancestors perceived that the sun and the moon influenced cycles (seasons) and tides on earth, they connected the position of these heavenly bodies (gods) to happenings on earth. 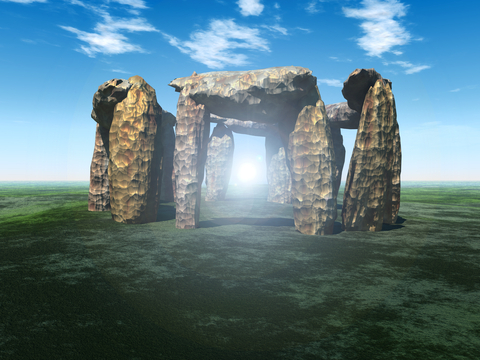 To be able to predict the future seasons they erected large stones, so they were not easily disturbed, in circles, to measure the position of the sun and thus could get a handle on when the cycle would repeat itself. These measurements were not as accurate as they are now but they discovered that the sun cycled in approximately 360 days. That explains why we still divide the circle in 360 degrees. When, because of the inaccuracy, the year got too much out of sync, they would add some festival days to correct that. We still do adjust our inaccuracy of a 365-day year by having leap years, and leap seconds. Stonehenge, although the most famous circle, is not the only example of such an observatory, there are many other remnants of such circles in the world. The persons who did the observations, and thus were able to make prediction of future events, were revered by their contemporaries and their leaders and thus became very powerful members of the tribe. When they connected the heavenly bodies with predictions of the future they understandably thought that the smaller bodies, planets and stars could predict the future as well and so astrology was born. Shooting stars (meteorites) were regarded as bad omens since folklore would tell of long ago impacts, as retold by storytellers and song, long before these stories were written down. The positions of all heavenly bodies, not only the sun and moon, were now thought to influence everything on earth. When you look closely at the stories in ancient texts, not only the bible, you realize that many of such tales are connected to heavenly observations, for example the Star of Bethlehem. “Wise Men” were astrologers who observed the heavens constantly. The sudden appearance of a supernova would often be interpreted with the birth of a “king”. We now know that gravity is the cause why we circle the sun and why the moon creates tides. The gravitational influences of the other bodies are so small that except for tiny adjustment of orbits of the planets and asteroids, there is no influence on the personal lives of individuals. The only prediction gravity can make about a person is, that if you are falling from a twenty-storey building, one can predict that you will die soon. Why then does the belief in astrology persist in a large percentage of the population? Humans want to know the future. The unknowable is feared. We like to believe that we can predict what is going to happen. Secondly, if the astrologer “predict” things based on past experience, human behavior and close guesses, some of the predictions will turn to be approximately correct. We are eager to believe that someone has the power to tell the future. We also do remember the correct guesses and tend to forget the wrong ones. We want to believe that someone has the power to tell the future, talk to the dead, solve mysteries and crimes. The shamans of today, psychics and astrologers, take advantage of the gullible among us. They are very familiar with human behavior and like psychiatrists they know how to illicit information without their clients realizing it. If they make a statement, which is a guess, they observe your reaction to it, if they detect a negative reaction in your facial expression, they correct them selves with a quick statement such as “I see a female, no a male” and again you tend to remember the near correct statements and forget quickly the wrong ones since you want to believe the psychic, that’s why you went there in the first place. Since fortunetellers can influence people to act upon their predictions with sometimes dangerous results (self-fulfilling prophesies), perhaps we should demand that so called psychics undergo a rigid scientific examination to prove their powers before they are given a license to practice. Until such powers are scientifically proven they should not be allowed to practice. Such tests, under strict laboratory conditions, have been performed with negative results so far. The James Randy Educational Foundation has offered a million dollar challenge, since 1964, to any astrologer or psychic who could prove their claimed ESP powers but no one has been able to pass the scientific tests.